The City of Las Cruces has initiated a process to update the community’s parks and recreation master plan. The Las Cruces Parks & Recreation Master Plan & Park Impact Fee Update was originally adopted by City Council in May 2012, and serves as the City’s “how to” guide in providing access to park land and recreational programs to the residents of Las Cruces. As the population of Las Cruces grows and land use patterns change, the City must continually re-evaluate how it provides park land and recreational opportunities to its residents. Are parks and recreational facilities distributed across the city in a manner that makes these amenities accessible to all? Do the recreational programs that the City offers to its residents meet the needs and preferences of the community? Is the City’s park system being managed and operated in an efficient manner? The parks and recreation master plan update process offers you a role in these considerations so that we can build a first-rate parks and recreation system for Las Cruces together. Parks and open spaces provide opportunities for both active and passive recreation. Active recreation includes organized sports and activities and passive recreation activities include hiking, biking, wildlife viewing, etc. Parks are places to socialize, engage other members of the community, and meet new people. Social interactions help build safe, connected, and friendly communities. Parks and recreation programs can have a positive social impact as young people have the opportunity to socialize through organized and unstructured activities which can develop life skills. People will visit a community because of local attractions which includes parks with desirable facilities or unique features. Attracting visitors to Las Cruces is a way to increase local revenue. Parks, open spaces, and conservation lands provide areas for native plantings and reclamation projects. When implemented correctly can address issues with storm-water runoff and mitigate flooding. 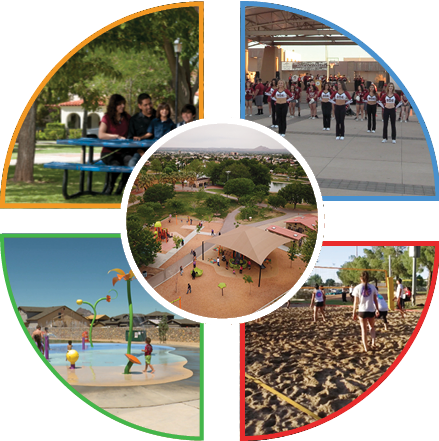 Ensuring that all community members can share in the benefits of its community’s parks and recreation facilities as Las Cruces grows and changes requires a recurring process of evaluating the way that recreational amenities are distributed, and how the system is managed. This process can lead to the more efficient use of resources and provision public space and recreational opportunities. Why has this project been initiated? Assumptions on the amount and location of “future” park land in the City of Las Cruces are based on the Las Cruces Parks & Recreation Master Plan & Park Impact Fee Update adopted in May 2012. The City’s population and land use characteristics have changed significantly since that time. This update process is part of the City’s effort to re-assess its park land distribution and level of service goals to ensure sufficient access to the system by current and future residents, and to formulate a development impact fee structure that meets those targets. The update process also offers the City an opportunity to re-evaluate the efficiency of how it delivers recreational services to the residents of Las Cruces. What will the major outcomes of the parks and recreation planning process? The Parks and Recreation Master Plan update assesses the conditions, offerings, and management of the City’s parks and recreation system. The updated Parks and Recreation Plan Master Plan will provide new recommendations on park land distribution and level of service, recreational program offerings, park conditions, and system management based on changes to Las Cruces’es demographics and land use characteristics over the last six years (and anticipated future changes). Beyond those improvements that will occur in conjunction with the City’s recently approved general obligation bond, the final plan will make recommendations on short-term and long-term capital investments to the City’s park system to further meet the recreational needs of the City’s current and future residents. What is the relationship of this planning effort to the Elevate Las Cruces Comprehensive Plan? The Las Cruces Parks and Recreation Master Plan process is being prepared concurrently with the “Elevate Las Cruces Comprehensive Plan.” The projects are independent – as the Elevate Las Cruces Comprehensive Plan addresses multiple topics including land use, mobility, housing, natural resources, infrastructure, economic development, etc. Nonetheless, many of the parks and recreation master plan findings and recommendations will be incorporated into the Elevate Las Cruces Comprehensive Plan. Who is preparing the Parks and Recreation Master Plan update? The Las Cruces Parks and Recreation Master Plan Update is being administered by the City of Las Cruces’s Parks and Recreation Department with support from the Community Development Department. The planning process is being led by Halff Associates, Inc., in partnership with the City. Information about the Parks and Recreation Master Plan planning team can be found here. How long will the planning process take? How can I become involved in the park and recreation master plan process? Let us know that you’re interested! Leave your name and e-mail address with us where designated on the bottom of any page on this website. Then receive e-mails notifying you of project events, activities, or updates. E-mail or social media not your preferred method of communication? Contact the City of Las Cruces Parks and Recreation Department at (575) 541-2550 to request event updates by mail, or monitor this website for information about upcoming public meetings and online surveys, or to review interim or final plan documents.